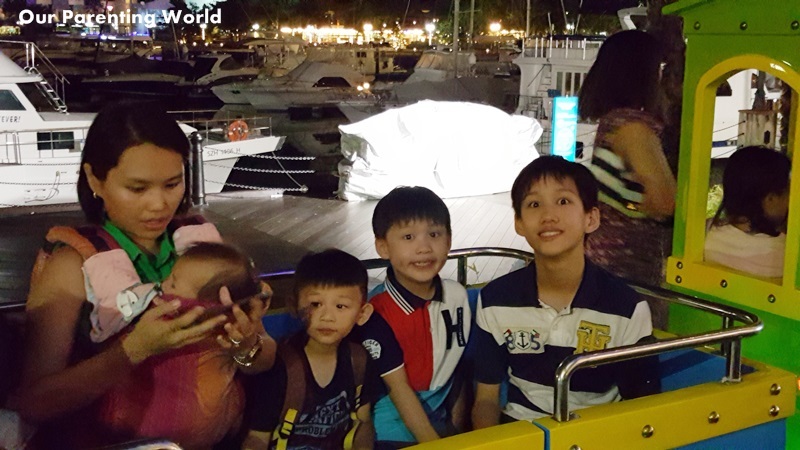 Our Parenting World team visited Quayside Isle @ Sentosa Cove recently to experience its latest attraction in time for the festive season! Visitors and diners can look forward to visit Quayside Isle @ Sentosa Cove to celebrate Christmas and soak in the festive joy with your family and friends. 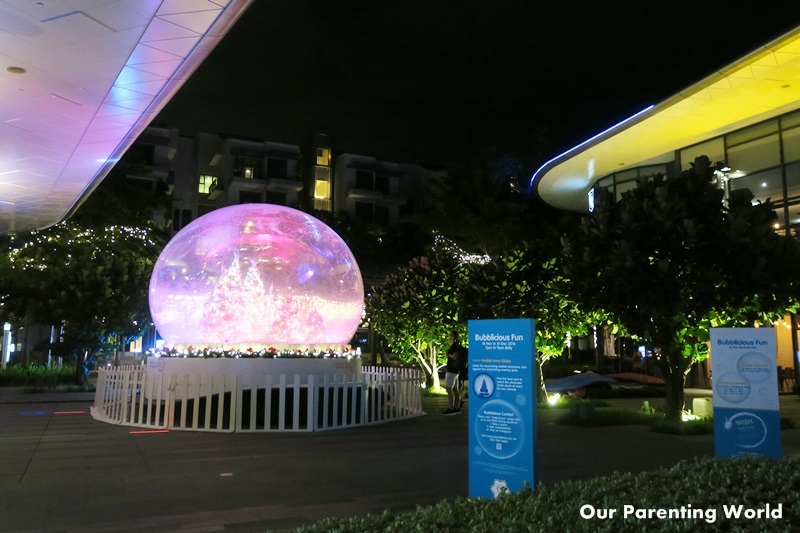 The beautiful Quayside Isle @ Sentosa Cove will be transformed into a Christmas Wonderland with magical bubble-themed display from 18 November to 31 December 2016. 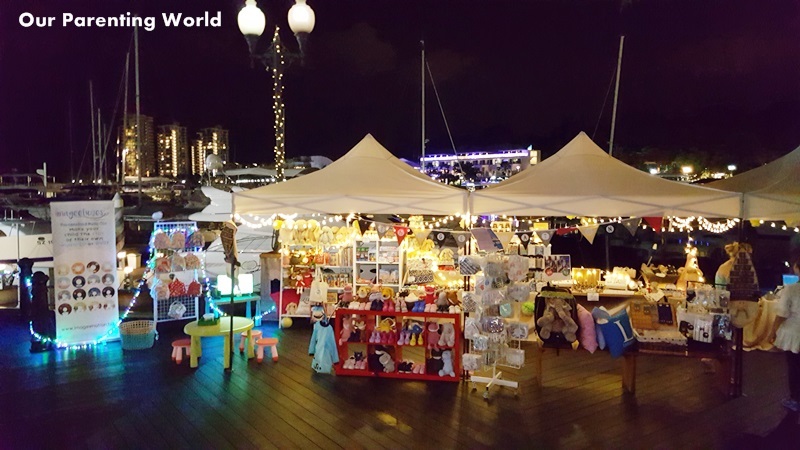 Need to do Christmas shopping, visit the quintessential yuletide market along Quayside Isle @ Sentosa Cove to satisfy your shopping needs! Have lots of Bubblicious fun with various interactive bubble installations that are being displayed. Have a fabulous bubblicious time and play with the interactive bubble installations not forgetting to take lots of pictures! 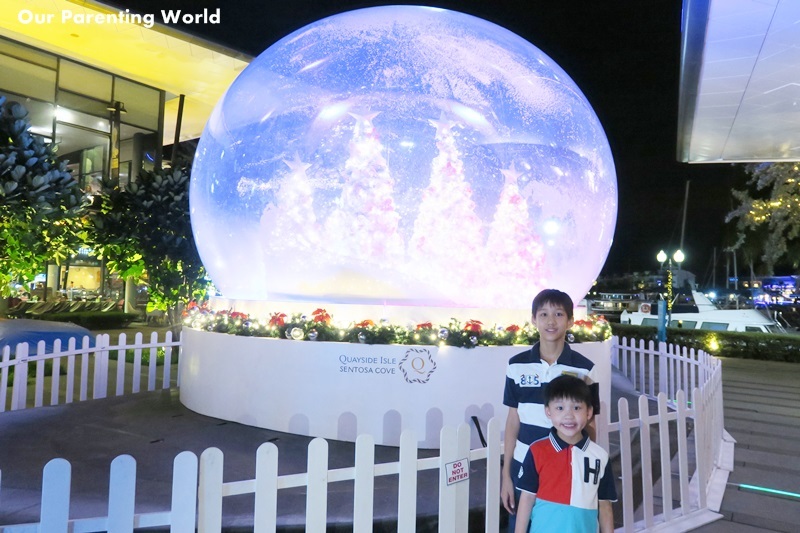 The bubbly experience along the marina is amplified with a giant snow globe situated at the Fountain Plaza, where bubbles will fill the air with a dazzling light show to enchant visitors every night. While you dine at any Quayside Isle @ Sentosa Cove’s marina-front restaurants, you will be able to witness a unique showcase of Christmas-themed boats. Visitors may catch the annual ONE°15 Christmas Boat Light Parade event as the boats set sail from the scenic marina in style for a night to remember. We are going on a train ride together with our friends! Admire the beautiful fairy-tale setting, take a stroll and enjoy the gentle, relaxing breeze together with your loved ones! Children can enjoy activities like bubble play zone, bouncy castle and game stalls. 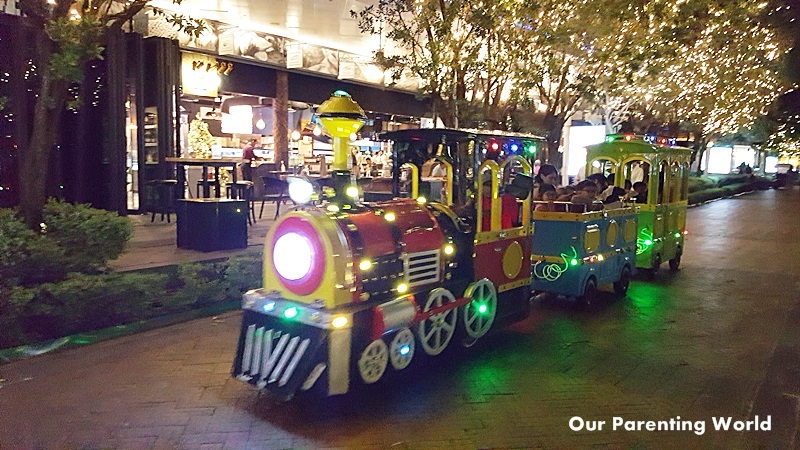 They will also be excited to know that you can ride on the very popular Choo Choo Train! Look out for Santa Claus during the lunch hours on weekends to receive candy canes, whether you have been naughty or nice. Indulge into a wide range of mouth-watering Christmas specials at Quayside Isle @ Sentosa Cove! Bond over good food and drinks with your family and friends at the picturesque view of the marina. 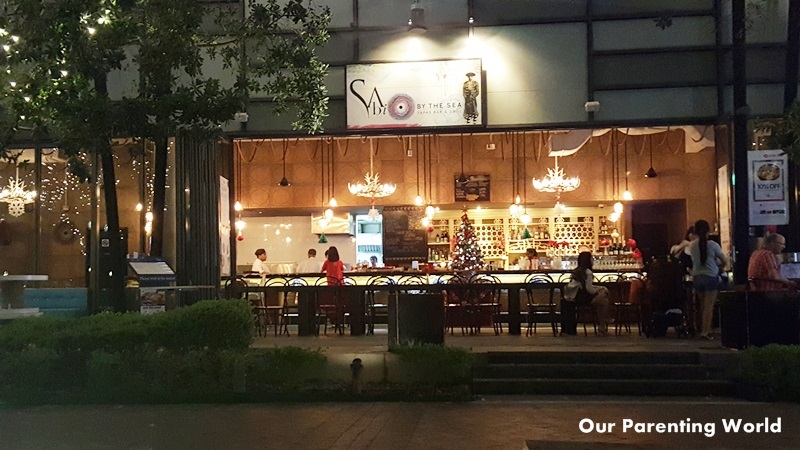 Our team visited Sabio by the Sea, Tapas Bar & Grill. Diners can enjoy a true Spanish experience with the restaurant serving grilled meats and fishes along with an array of traditional tapas and a large selection of Spanish wines and beers. 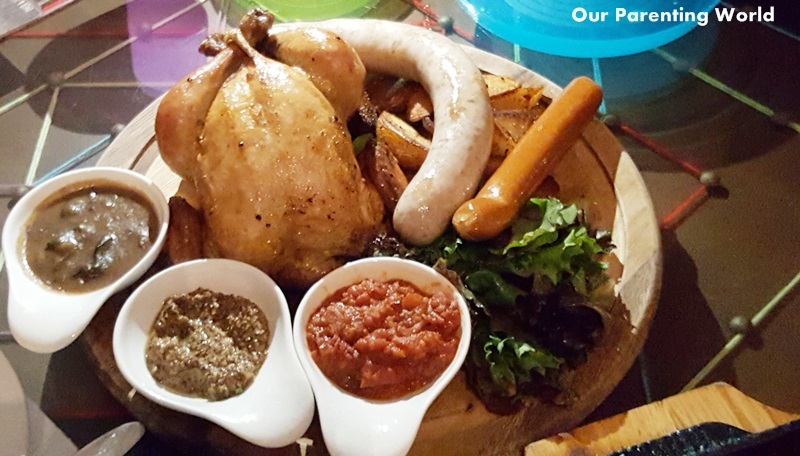 We have tried Pollo Con Samfaina – Spring Chicken with Paella Rice Stuffing, 2 types of Sausages, Garlic Mushroom & Garden Salad. This is a traditional Spanish set menu that come with three different sauces as well as a serving of Churros. The chicken is well-marinated, the meat is so soft and easy to slice. The best part is that the chicken meat is very tender and with Paella Rice Stuffing is really tasty. The kids enjoy the chewy and flavourful sausages. Churros, we absolutely love this! 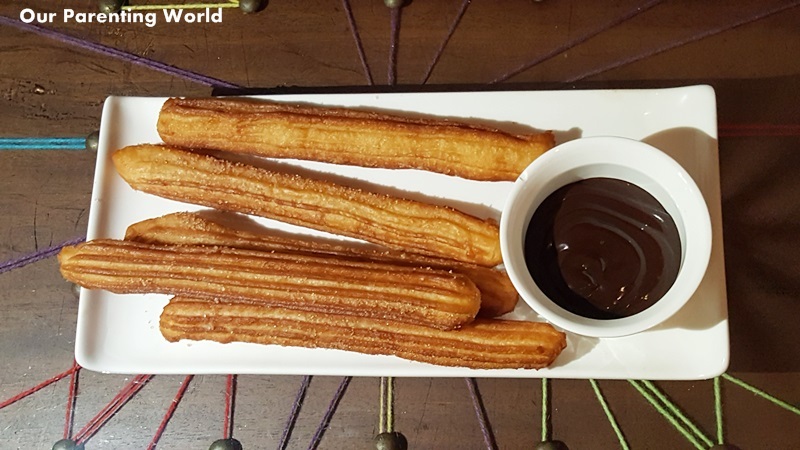 Churro is a deep-fried dough pastry that is very popular in Spain where the churros there are commonly found to be either long or thin and thick. The churros are served warm and glittered with sugar and cinnamon which is crunchy on the outside and the inside remains fluffy. It comes with chocolate sauce for you to dip your churros with. 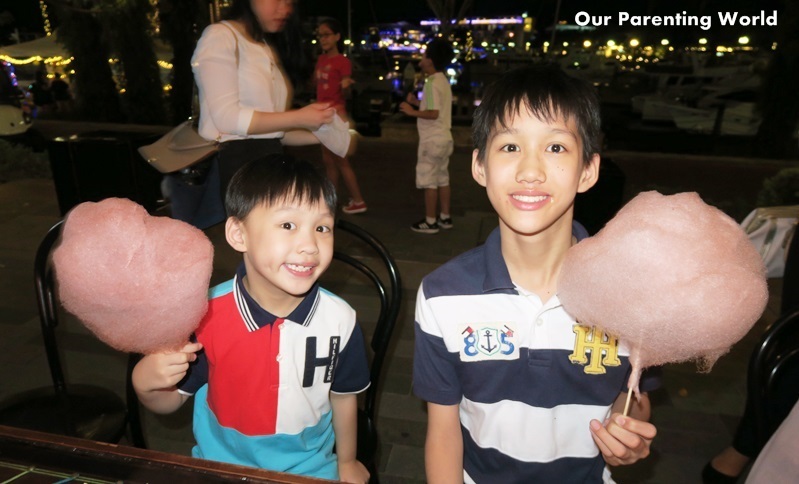 Sabio by the Sea, Tapas Bar & Grill brings more delights to diners with the kids enjoying free flow of cotton candy! Good News! 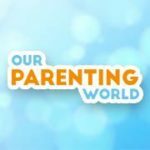 Visit Sabio by the Sea, Tapas Bar & Grill and show Our Parenting World’s blog post and you will be entitled to Free Churros! Get your Free Churros today! In the event of any dispute, the Management’s decision is final and no correspondence will be entertained. Deliciae Hospitality Management Pte Ltd reserves the right to vary the terms and conditions governing this promotion without prior notice at its own discretion. 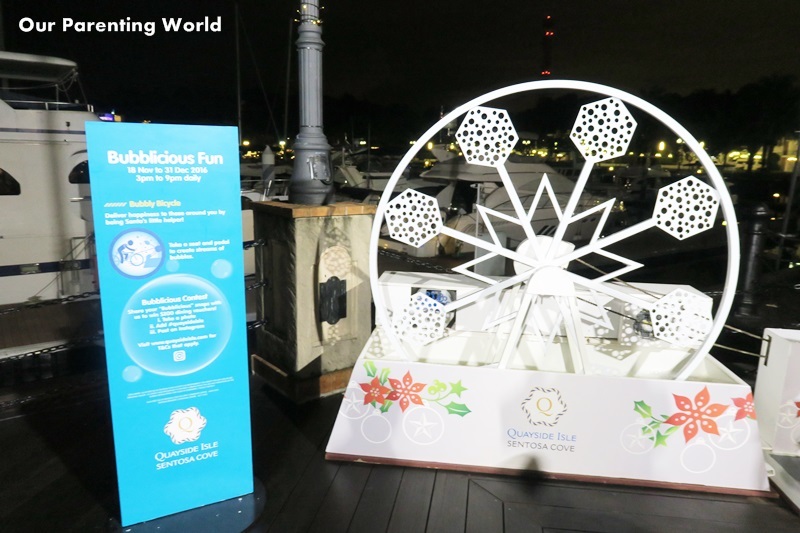 ‘Tis the season of giving, and Quayside Isle @ Sentosa Cove will be gifting visitors in the Bubblicious Instagram contest and City Developments Limited malls’ “Wish for the Stars” lucky draw. Dining vouchers from Earl of Hindh, Greenwood Fish Market and Gin Khao Bistro are up for grabs in the Bubblicious Instagram contest, where visitors simply have to upload a photo taken with any of the bubble-themed activities to Instagram with the hashtag #quaysideisle for a chance to win. Or, win a staycation at W Singapore – Sentosa Cove and vouchers when you “Wish for the Stars” and take part in City Developments Limited malls’ lucky draw. Every $80 spent in a single same-day original receipt earns you a lucky draw chance, capped at 10 chances per receipt. For a full list of promotions and events available at Quayside Isle @ Sentosa Cove this Christmas, please click HERE. Quayside Isle @ Sentosa Cove is easily accessible by cars and taxis, with ample parking spaces available at its basement carpark. On weekdays, admission to Sentosa by car is just $2 during lunchtime (12pm to 2pm) and dinnertime (after 5pm) and parking is complimentary for cars entering the carpark after 12pm and exiting before 2.30pm. Passengers may alight at the Fountain Plaza drop-off point that faces The Residences at W Singapore – Sentosa Cove. Visitors may also opt to take the new Sentosa Cove shuttle service to Quayside Isle @ Sentosa Cove, available daily from 6.15am to 11.30pm, at an average of 30-minute intervals. The shuttle service is open to the public at $2 per ride, and takes passengers from VivoCity or HarbourFront Bus Interchange directly to Sentosa Cove Village drop-off point, a 3-min walk from your gourmet getaway at Quayside Isle @ Sentosa Cove. 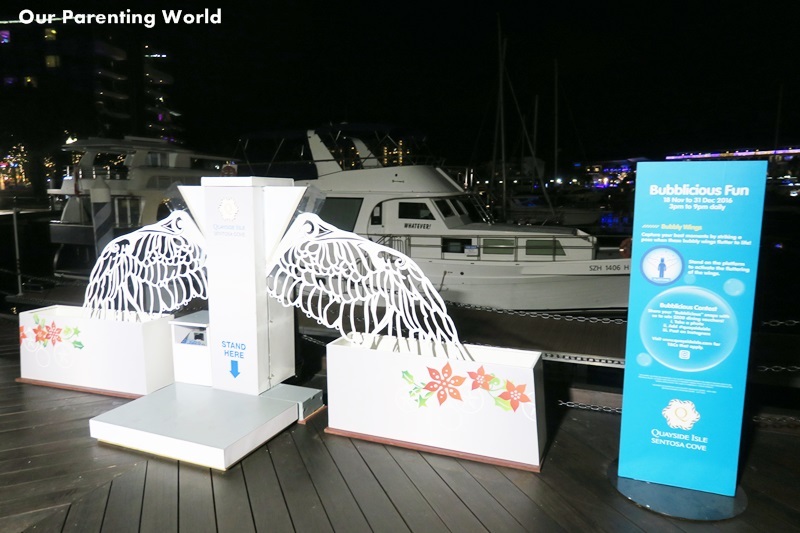 Alternatively, a free shuttle service is also available within Sentosa from Beach Station Bus Interchange to W Singapore – Sentosa Cove hotel, a 1-minute walk from Quayside Isle @ Sentosa Cove. This complimentary bus (Bus no. 3) is available at between 8am and 10.30pm daily in 30-minute intervals. For the full bus schedules, check out www.quaysideisle.com. To make frequent visits to Quayside Isle @ Sentosa Cove even more affordable, simply apply for Sentosa’s Islander Pass and enjoy a year’s unlimited island admission and privileges. It costs just $25 for Individual and $50 for Family memberships. For information on how to apply for Sentosa’s Islander Pass, please click HERE.